Squamous cell carcinoma (SCC) of the renal pelvis is particularly rare and accounts for 0.5% of renal malignancies and <10% of renal pelvis tumors. Predisposing factors include chronic infection, long-term exposure to calculi, hormonal deficiency, endogenous and exogenous chemicals, radiotherapy, and vitamin A deficiency. It manifests a quite aggressive course and is usually diagnosed after surgery and at advanced stages. This case presents a renal pelvis SCC diagnosed following surgery in a young female patient with a staghorn calculus and metastases that developed over a very short time and were detected with 18F-fluorodeoxyglucose positron emission tomography/computed tomography (18FDG PET/CT). A 38-year-old female patient presented to our clinic due to a right-side pain which had existed for a long time but increased in severity in the past month. The patient who had been suffering from the recurrent stone disease for the past 20 years had right percutaneous nephrolithotomy in her history, performed in the year 2007. The physical examination of the patient, who had no systemic diseases and reported using anti-inflammatory medication, revealed no findings other than right costovertebral angle tenderness. Laboratory tests detected her creatinine level as 69.84 μmol/L, and abdominal computed tomography (CT) scan was ordered. The CT scan revealed a 6 × 4 × 4-cm staghorn calculus in the right kidney that filled all calyces, along with thinning of parenchyma particularly in the inferior region of the kidney, lesions in the lower pole, and moderate hydronephrosis. Dynamic renal scintigraphy reported the contribution of the right kidney to total kidney function as 14%. The patient provided consent and surgery was performed through a right subcostal incision. During operation, it was seen that the renal pelvis was enfolded in a yellow crust and there were densely scattered pus foci in the kidney. Because the medial edge of the kidney was in close contact with the vena cava inferior and their borders could not be distinguished, it was separated through sharp dissection, and a decision was made to conclude the procedure with radical nephrectomy. Histological evaluation revealed a moderately differentiated 4.5 × 4.5 × 5-cm SCC that was invading the renal parenchyma, corresponding to the region where the calculi were found, manifested large areas of necrosis, and did not present lymphovascular invasion [Figure 1]. The patient was discharged on the third postoperative day with no problems, however, presented with severe lumbar pain on the 45th day. Abdominal ultrasonography (US) was taken and provided normal results. However, since the patient experienced severe pain and did not respond to opioids, an 18FDG PET/CT was performed on the 50th day. This revealed paracaval lymphadenopathy (SUVmax: 14.7) of 19 mm size with increased F-FDG uptake [Figure 2]. In the second postoperative month, an increase in lymphadenopathy size could be seen in the CT scan and metastasis was detected in the T11 vertebra. The patient was referred to the oncology clinic and died on the 17th postoperative month, despite undergoing repeated cycles of gemcitabine/cisplatin chemotherapy. In renal SCC, which is unusually encountered in the kidney and is closely related to chronic irritation and inflammation, 50% of the patients present a history of long-term exposure to calculi, as seen in our patient. Neoplasia forms on the basis of squamous metaplasia that develops due to chronic irritation. Imaging methods, particularly CT and the US, usually demonstrate the calculi and obstruction-induced hydronephrosis, causing renal SCC to go often undetected. While SCC was atypically encountered in a young female patient in our case, it is seen more commonly in late adulthood and males, probably due to the higher prevalence of stone disease in men.,, Since renal SCC does not possess any specific clinical or radiological characteristics, it is usually diagnosed after nephrectomy. As surgical treatment is the main and primary treatment of SCC, this situation is not considered to be a problem concerning the course of the treatment. However, due to the aggressive quality of a tumor, most patients are diagnosed at stage pT3 or further stages and the average survival time is seven months. Considering the aggressive nature of renal SCC and the short survival time, the stage of the disease must be verified following nephrectomy, and early systemic treatment must be ensured. While the effectiveness of 18F-FDG PET/CT for renal malignancies is lower than for extrarenal malignancies due to the low activity of radioactive urine and renal neoplasms, it was reported to be useful in the diagnosis of SCC originating from the renal pelvis. Routine preoperative use of 18F-FDG PET/CT imaging in patients with chronic staghorn renal calculi to eliminate the possibility of SCC must also be considered regarding cost-effectiveness. In addition to being primarily used for the diagnosis of SCC, 18F-FDG PET/CT is also practical for the diagnosis of early metastases as presented in our case. Renal SCC, which develops as a result of chronic irritation caused by renal stone disease, is usually diagnosed histologically after nephrectomy due to lack of clinical and radiological findings. In cases that SCC, which has an aggressive course, is diagnosed after nephrectomy, investigating the presence of metastasis with 18F-FDG PET/CT and initiating early systemic treatment if needed may contribute to survival. Busby JE, Brown GA, Tamboli P, Kamat AM, Dinney CP, Grossman HB, et al. Upper urinary tract tumors with nontransitional histology: A single-center experience. Urology 2006;67:518-23. Bandyopadhyay R, Biswas S, Nag D, Ghosh AK. Squamous cell carcinoma of the renal pelvis presenting as hydronephrosis. J Can Res Ther 2010;6:537-9. Somani BK, Nabi G, Thorpe P, Hussey J, Cook J, N'Dow J, et al. Is percutaneous drainage the new gold standard in the management of emphysematous pyelonephritis? Evidence from a systematic review. J Urol 2008;179:1844-9. 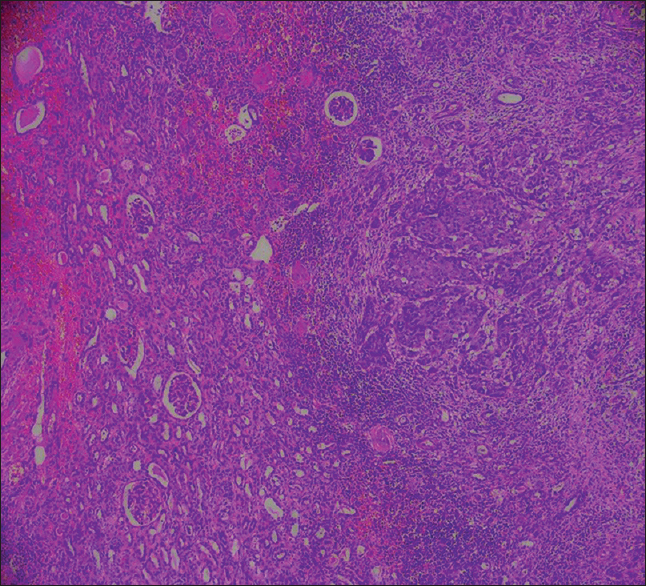 Ghosh P, Saha K. Primary intraparenchymal squamous cell carcinoma of the kidney: A rare and unique entity. Case Rep Pathol 2014;2014:256813. Baseskioglu B, Yenilmez A, Acikalin M, Can C, Donmez T. Verrucous carcinoma of the renal pelvis with a focus of conventional squamous cell carcinoma. Urol Int 2012;88:115-7. Palmer CJ, Atty C, Sekosan M, Hollowell CM, Wille MA. Squamous cell carcinoma of the renal pelvis. Urology 2014;84:8-11. Jain A, Mittal D, Jindal A, Solanki R, Khatri S, Parikh A, et al. Incidentally detected squamous cell carcinoma of renal pelvis in patients with staghorn calculi: Case series with review of the literature. ISRN Oncol 2011;2011:620574. Jiang P, Wang C, Chen S, Li J, Xiang J, Xie L. Primary renal squamous cell carcinoma mimicking the renal cyst: A case report and review of the recent literature. BMC Urol 2015;15:69. Kalayci OT, Bozdag Z, Sonmezgoz F, Sahin N. Squamous cell carcinoma of the renal pelvis associated with kidney stones: Radiologic imaging features with gross and histopathological correlation. J Clin Imaging Sci 2013;3:14. 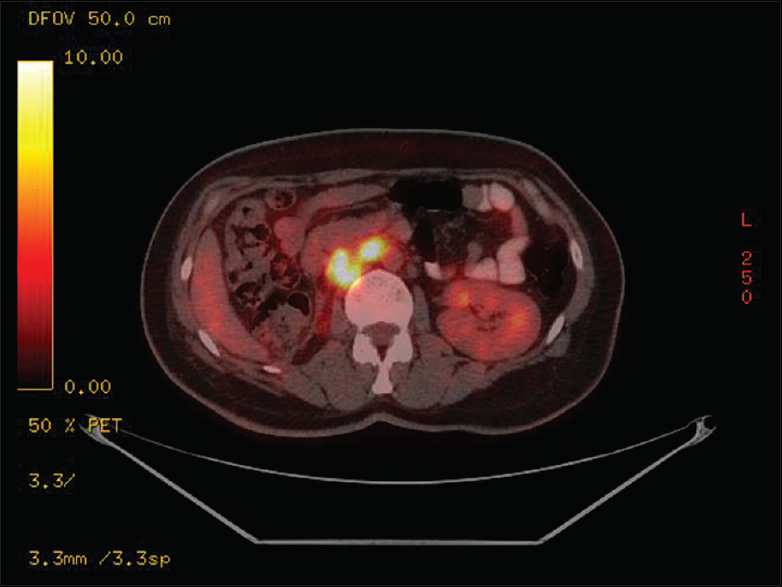 Deng S, Zhang B, Huang Y, Li J, Sang S, Zhang W. Case report of primary renal pelvis squamous cell carcinoma coexisting with long-standing calculi in left kidney on 18F-FDG PET/CT. Medicine 2017;96:e6341.